Online Learning is a unique, easy and affordable method of gaining knowledge nowadays. The digital technology has geared up the e-learning platform to achieve the milestone in higher education. Most of the Edu-tech companies tie up with the institution to provide certification courses which are exhaustive and made out of expert recommendations. The applicants are inclined towards exploring these advanced learning methodologies. But the question to be asked is what makes your course differential to your competitor? Is it USP? Is it Faculty? Is it curriculum? Is it Price? Or what. The relevance lies in digital presence, the reach, and engagement towards the course offered by institution or organization. 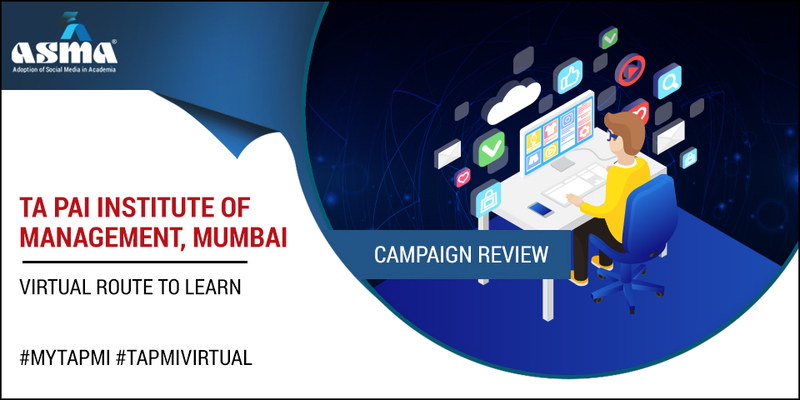 To create brand awareness about TAPMI virtual learnings. To promote advanced courses offered by TAPMI on social media. To increase applicants for advanced courses and certification. Run campaigns to enhance application for certifications and online courses. Course promotion post over social media (Facebook and Twitter). Virtual learning is the next big way in Higher education, and that’s what is going to make difference in the future. Digital technologies are adding up to these significant transformations. TAPMI started with these advanced certificate courses at the executive level. Majority of the Institute in India has started these certification courses including Edu-tech companies but what is more important, is whether your target audience knows about courses offered by you? More importantly, your presence over digital media is vital to drive up applicants for these courses. TAPMI makes it more vibrant over social media to reach to right audience. The approach was to enhance the reach and hit the right target audience with the right social media platforms. Course offered were shared on social media keeping the USP intact in each post. The popular practice of content marketing has been adopted. The brand equity has been leveraged with such solid content in forms of post and videos. Faculty testimonial, talking about the best about the courses and for whom these courses are relevant. The posts are complete in the sense, it doesn’t lack any vital information about the course offered. It contains, what is the course objective, For whom it is, How it will benefit, and How to registration details along with the appealing banner image. The hashtags used the posts are related to the course offered. According to KPMG, by 2021, the online education industry will be $2 billion industry in India. The strategy over Facebook was slightly different, where they highlighted the stakeholder or executor of the course, “the faculty”. The vast experience and rich industry knowledge of faculty make more impact over the engagement level on the post, the good number of likes and engagement rate have been seen on these posts. Video marketing is growing at a very high rate, according to research 80% of web traffic will come from Video only. YouTube is the second largest search website after Facebook. The Video promotion strategy has been adopted by TAPMI, Faculty monologue videos are uploaded on YouTube which gives insights about the background of faculties. Their rich experience, major opportunities for a student opting for course, challenges in the industry. how these courses will help candidates to have a robust understanding to leverage the opportunities and cop up with challenges. The series of videos are being uploaded on the TAPMI official channels.